Why is it that the world appears to have waited until immediately after Xmas and my birthday to come up with a shed load of stuff I'd like. 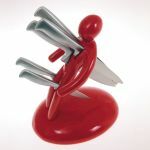 This knife block gives you the opportunity stab someone to death at your culinary convenience. And, because I have real problems writing (my hands get tired very quickly and my handwriting is barely legible) I'm a sucker for any re-designed pen that promises to make the job easier. And finally two USB mixers that would let me turn my spanking new laptop into a complete DJ deck. Sweet. Best of all, according to createdigitalmusic.com they're priced just $60 and $250 respectively. That'd be just �30 and �130 if the price translates to UK outlets.